The idea of the current Latin American and Caribbean Center on Health Sciences Information (BIREME), a specialized Center of the Pan American Health Organization/World Health Organization (PAHO/WHO) arose from the need to create a Regional Medicine Library to meet the great demand of Latin American medical researchers and students for copies of scientific journal articles, which were, until then, directed to the U.S. National Library of Medicine. From that stemmed off BIREME’s mission to democratize and facilitate access to scientific information in health, which has remained up-to-date along its 50 years of existence. The collection of scientific journals of the then Escola Paulista de Medicina (EPM) was the embryo of the Regional Medicine Library, which was rapidly expanded and regularly updated until 2006, with funds from the Brazilian Ministry of Education. It was considered for a long time one of the most complete collections in this field in the Latin America and the Caribbean Region (LA&C). In spite of that, other libraries were part of the Network to complement BIREME’s physical collection and meet the countless requests for copies of documents that were managed through the traditional service of bibliographic commuting or interlibrary loans, which started in 1969 as a collaborative service coordinated by BIREME. Until the mid-1990’s, many users from Brazil and other countries used to go to BIREME to consult its collection and conduct searches in the well-known Index Medicus books, which occupied large tables in the Library reading room, a fact always mentioned in spontaneous reports of BIREME’s users of that time. After 1988, BIREME started to offer its users remote access services to some databases, such as the Medical Literature Analysis and Retrieval System Online (Medline) and Latin American Literature in Health Sciences (LILACS), and for requests of document copies, expanding and facilitating user access to health information. With the Internet, the Virtual Health Library (VHL) was born in 1987, and BIREME definitely entered the virtual world and transferred to the Federal University of São Paulo (UNIFESP) the services for Library users. BIREME kept the physical collection of journals under its management until March 2016, when UNIFESP took over its maintenance and operation. In 2017, when BIREME turns 50 years old, it reaffirms its commitment to contribute to the development of health of populations in LA&C through technical cooperation among countries, aiming to promote and democratize production, access and use of health information. All along its history, BIREME has conducted this technical cooperation focusing on scientific and technical information in health, however, evolving with successive models of information and knowledge management. It moved from the model centered on the development of physical collections and basic functions of a medical library towards the VHL model, which gives priority to online access, distance courses and electronic publishing, as well as the development of products and services to meet PAHO/WHO Strategic Plan for technical cooperation and the Sustainable Development Goals. Since BIREME started coordinating the network operation of bibliographic commuting service, in 1969, more than six million requests for document copies were processed, with the Library Network responding to an average rate of 85% of the requests. Until 2003, requests for document copies were based on the hard copy collections available at the Cooperating Libraries, most of them in Brazil. After that, with the growing online availability of full texts, with open or controlled access, there has been an expected reduction in the demand for copies of documents available in the physical collections of libraries, as a whole. 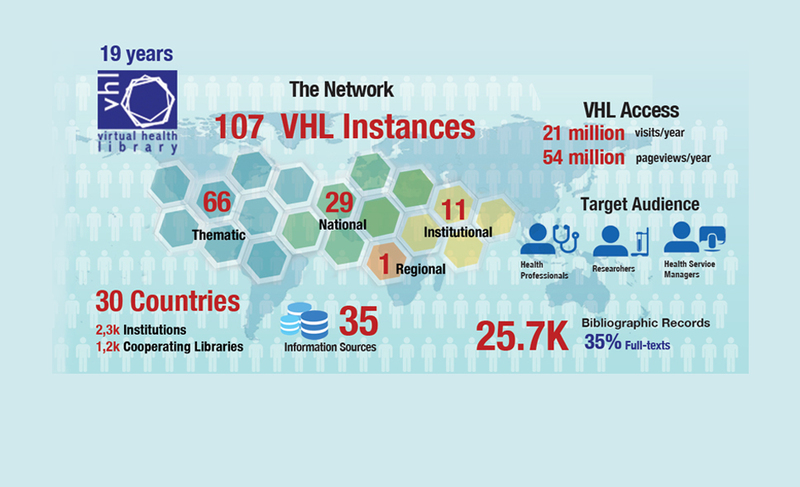 As an evidence of this fact, the VHL Regional Portal gathers more than 26 million bibliographical references of documents from about 30 databases, of which 9.2 million provide a link to the full text. Considering only the documents published in the last five years, 85% have open access full text available online. In the LILACS database, which records the scientific and technical literature published in LA&C countries, this rate exceeds 90%. As to the volume of accesses to the VHL Portal, it reached the monthly average of 1.5 million visits in 2016, which generated 5 million pages visited per month. It is undeniable that information is becoming increasingly more available and accessible, both as metadata in the databases at the VHL Network, as well as through open access full texts. However, the current challenge for the technical cooperation of BIREME and its collaboration network is to develop the culture of using information and evidence to make decisions at all healthcare levels, and to generate information products and services aligned to the need of translating knowledge to respond to local health priorities in the Region.